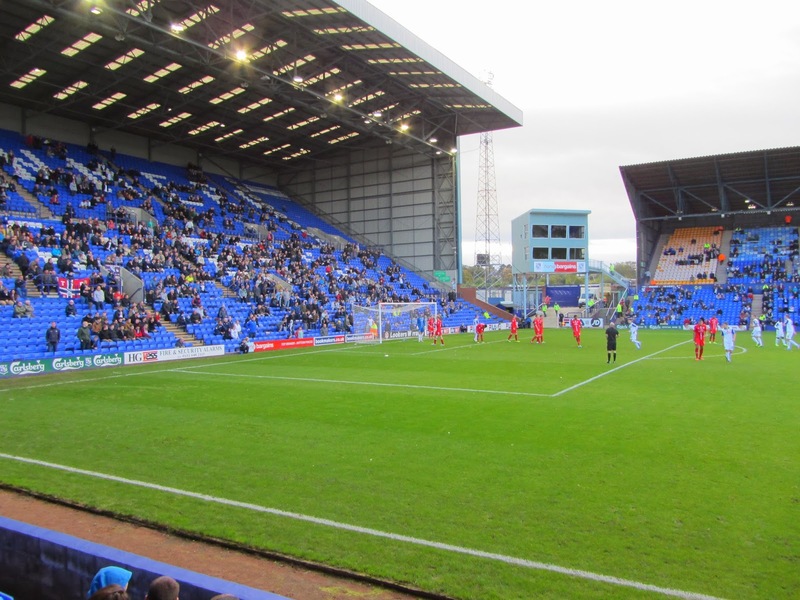 My twenty-fourth stadium of 2013 was on Saturday 26th October 2013 at Prenton Park in Birkenhead, Merseyside. The match was Tranmere Rovers vs. Milton Keynes Dons in Football League One. 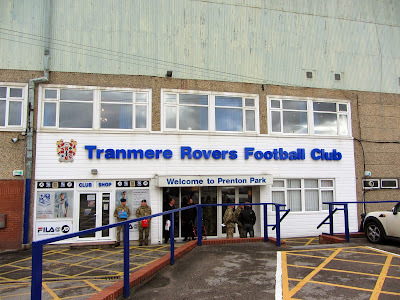 Prenton Park is located in the Prenton area of Birkenhead and is 1 mile from the nearest railway station at Rock Ferry. The venue has been home to the club since 1912. Prenton Park was extensively renovated over the 1994-1995 season in order to fulfil the requirement for clubs in the top two tiers to have all-seater stadiums. 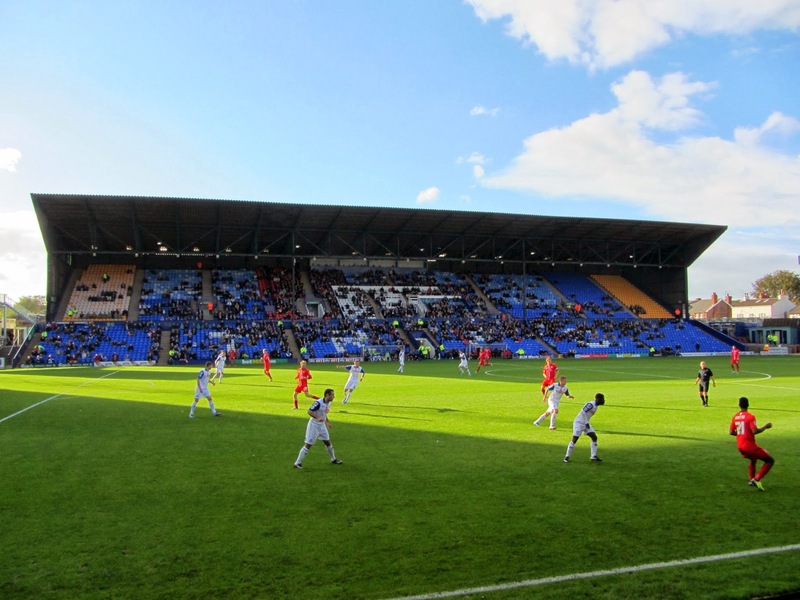 The Main Stand is on the west of the ground and is the largest at Prenton Park with a capacity of 5,957. The stand is a two-tiered structure consisting of a 3,598 capacity upper tier and a 2,359 capacity lower tier. The stadium reception, club shop and hospitality areas are all in the Main Stand. Opposite the Main Stand is the Johnny King Stand. As this backs onto the road behind the ground this is the smallest stand at Prenton Park - it has a capacity of 2,414. Before the stadium redevelopment The Kop behind the southern goal was an uncovered terrace - in 1995 it was re-opened as an impressive all-seater structure with room for 5,696 fans. The Cowshed Stand is behind the northern goal and because of the road running behind it the stand has an unusual slanted look. The Cowshed Stand can seat up to 2,500 away supporters. Both teams went into this game on a poor run of form with Tranmere yet to win at home and MK Dons having only recorded one away win. The opening goal came from a defensive error in the 7th minute - a long ball was played from the edge of the Tranmere box and MK Dons defender Shaun Williams headed the ball into the path of Ryan Lowe who was able to lob goalkeeper Ian McLoughlin from 20 yards. 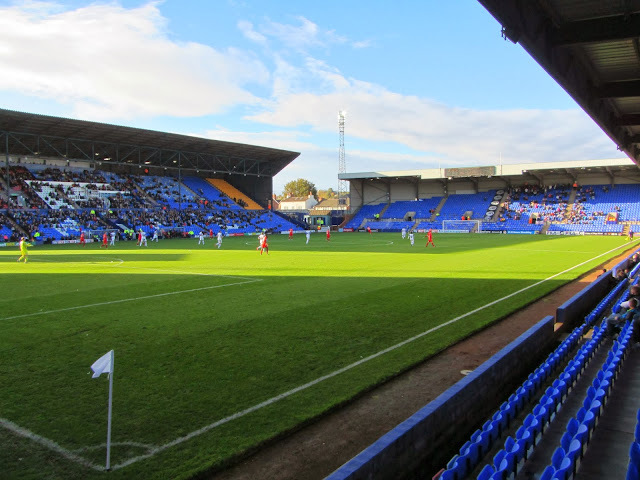 Tranmere did not look like a team in the relegation zone in the opening half an hour as they played well and easily contained the threat from the visitors. That changed in the 39th minute when Tranmere stood off Daniel Powell and allowed him to run unchallenged before shooting into the bottom corner from just outside the penalty area. This gave the visitors a lift and they ended the half in strong form. This continued into the start of the second half as Jason Banton beat a defender before curling a 25-yard effort into the corner of the net. Tranmere were under pressure at this point and the visitors came close to wrapping the game up with a third goal. In the 65th minute the home side won a free-kick and as it was lifted into the box Jimmy McNulty was fouled by Jordan Spence. Ryan Lowe tucked away to penalty to even the score up at 2-2. The rest of the game was end-to-end stuff - Patrick Bamford missed an easy chance to put MK Dons back in front and they were made to pay for this in the 84th minute when a cross into the area found Jake Kirby who clipped the ball back to James Rowe to shoot home to win the game for Tranmere.